Measures 21″ from end to end. The large central panel measures 2 3/4″ tall x 2″ wide at its widest point. The panels that constitute the majority of the wearable length each measure 1 3/8″ long x 3/8″ wide. 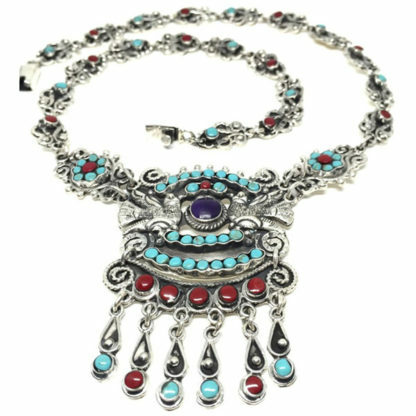 This 925 sterling Taxco Mexico vintage style silver necklace exhibits a gorgeous display of hammered silver scroll and bead work, and it has been accentuated by an array of multiple color inlays!! The central panel of this piece offers a dove lovebird motif, and the silver work has been accented by an oxidized finish for added texture and depth.